I have connected an air pump for print cooling (with a Berd-Air). It's a 24 V pump, drawing around 0.5 A according to my bench power supply. I connected it to FAN0 and attached a flyback diode (in the correct orientation). Recently (I don't know why it worked for a couple of weeks), my Duet Wifi resets 30-60 seconds after I turn the pump on. I have tried both a 1N5400 and a 1N4007 diode for flyback, but that doesn't appear to make a difference. Any idea what could cause this? 0.5 A should be fine for the PWM fan ports, right? 0.5A should be fine. Where have you connected the flyback diode? The best place is on the motor terminals if it has any, otherwise as close (in wiring terms) to the motor as reasonably possible. 1N4007 is a good choice. I just tried using FAN2 instead of FAN0, but that didn't help. Duet reset after 70 seconds. Could the motor be seizing up after running for a little while? Is there anything else the Duet is doing at around the same time as turning the pump on, or a little later? Hmm. Interesting idea. I don't think so, but that I guess something like that would cause it to draw too much current, right? If I connect it to my bench power supply, which has a current meter, it runs along just fine around 540-550 mA without any apparent problems. I guess there could be some kind of momentary surge of current that I couldn't see on that display. The Duet is doing nothing else (as far as I know). I just go to the web interface and set the fan speed and it dies after a few seconds. I have now tried connecting a power MOSFET between Duet and the air pump, but that didn't make a difference either. Perhaps there's a momentary short in the pump, which I might not notice when using the bench power supply, which probably has protection against that. No idea what I would do about that, though. Buy a new pump? The power MOSFET should protect the Duet from that sort of stuff. Are you running the pump.off a seperate supply.niw you are using an external supply? Another thing worth a try is switching fan pins to see if there is an issue with that particular fan channel. That pump looks like the same one I'm using best I can tell from the pic. I have a small 12V 5A power supply for the pump and a 24V supply for everything else. Before I installed mine I tested on 24V and the instaneous power on spike was in the range of 3.2A and the pump ran really hot so I used a separate 12V supply. They (China) advertised 24/12V but running the numbers down on the motor itself led me to the conclusion that mines a 12V 550. I finally ran down what I think is the actual manufacturer. It might be worth putting a power resistor in series with the motor to limit current surges. If its running current is about 0.5A then a value of 1 to 2 ohms should be about right. If the motor has a built-in capacitor for interference suppression, that would give rise to current surges when PWM is used - giving another reason to add the resistor. David what sort of power rating would you suggest? I have a 24V version of the same/similar pump and have not had any issues yet. I generally run it at 0.3-0.7 PWM. The steady-state power dissipation @ 0.5A would be 0.25W for a 1 ohm resistor, or 0.5W for a 2 ohm resistor. So 1W or 2W should be adequate unless the motor stalls. Interesting. Thanks, I will try that tonight. I don't have any power resistors, but putting eight 0.25 W, 15 Ω resistors in parallel should work for now. Just my thoughts : What's happening at that same moment in your printer. Could be a power dip too. 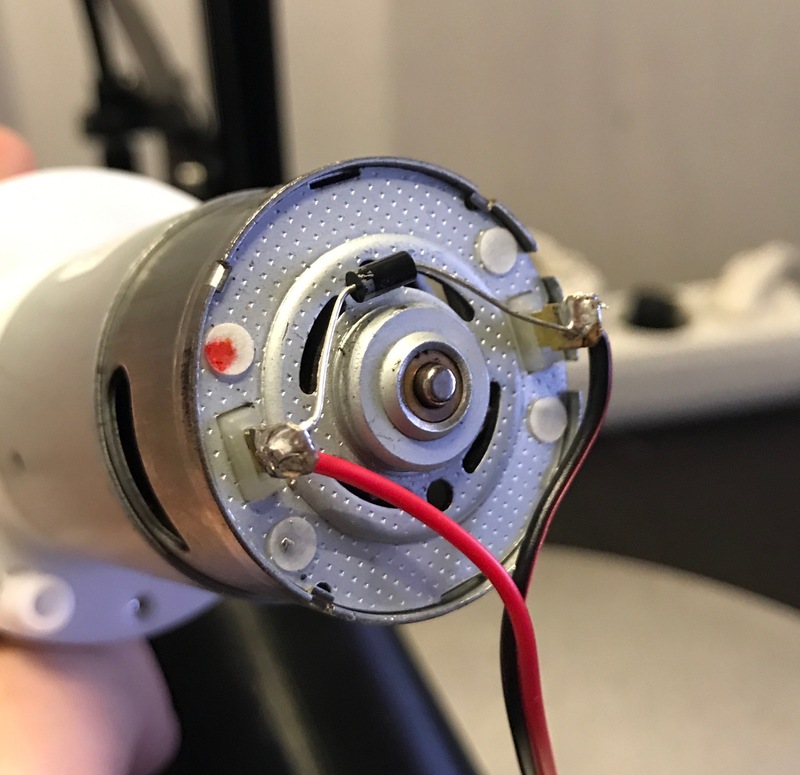 Is the metal frame of the pump motor in contact with anything? Do the wires between the Duet and the motor run parallel with any other wires? I'm wondering if it could be an interference issue.